Bft Automation design, manufacture and distribute entrance automation technology which controls access for people and vehicles in residential, commercial and urban environments. We are best known for door and gate automation technology but over the last 35 years, our product range has expanded to include traffic barriers, automatic bollards and parking management systems. BFT UK operates a nationwide distribution network with offices in Stockport, Swindon and Dublin. Bft Automation was founded in Thiene, Italy in 1981 with a focus on being customer-orientated. The approach of focusing on the customer, providing support and being easily available to customers, quickly won the loyalty of those working across the automation world. The name Bft comes from: Bonollo (name of the family), Francesco (name of the founding father) and Thiene (town where the business was set up). Over time, as the business grew, Bft began acquiring companies within the automation industry. Bft Automation opened the first branch in Germany after the acquisition of one of the largest customers in 2002. This was the first foray into a local market and the beginning of the process to understand each country’s individual requirements. From this initial step, Bft Automation began to diversfy products and services to suit the needs of the local markets, whilst still prioritising customer satisfaction. 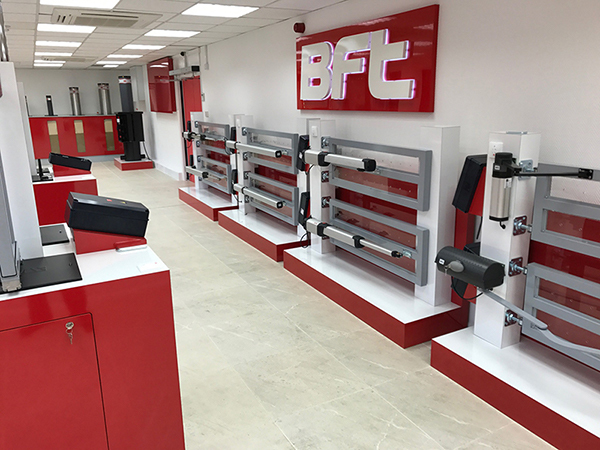 Bft Automation opened the first branch in the United Kingdom in 2004 after the acquisition of an automation business in the North of England. Three years later in 2007 a second automation business in the South of England was acquired, giving Bft Automation nationwide coverage in the UK. Finally in 2010 Bft Ireland was opened after the acquisition of a Dublin based automation business. Bft Automation now operates from three offices in Stockport, Swindon and Dublin giving total coverage of the UK and Ireland. Since 2004 Bft Automation has been part of the Somfy Group: which has given us the support to gain significant market share and build a structured distribution network. A radical change that has facilitated the transition from family-run business to multinational organisation.